This morning, I re-discovered a recording I made in the early morning hours of January 25, 2015 on 6,230 kHz SSB: the Australian Bureau of Meteorology’s marine weather radio service. This was actually a new station for me and, no doubt, decent DX (though I’m sure the broadcast is quite audible when conditions are favorable). While I prefer old-school recorded voice for shipping forecasts, this nonetheless has a catchy cadence. This entry was posted in Broadcasters, News, Recordings, Shortwave Radio and tagged 6230 kHz, Australia, Australia BOM Radio Service, Australia Bureau of Meteorology Radio Service, Australia Shipping Forecast, Marine Weather, Shipping Forecast on March 17, 2015 by Thomas. Last Monday, while taking a walk and listening to a Tecsun PL-380 in review, I tuned to WWV (10,000 kHz) at 10 minutes after the hour. I heard a full NOAA marine weather report including tropical storm activity in the Atlantic and a weather system in the Pacific that could potentially threaten west coast marine traffic. This reminded me that WWV is a one-stop source for a lot of information, not “just” the time of day that we all expect of it. In fact, the NIST (National Institute of Standards and Time) recently conducted a survey where they asked listeners what they liked/used of the existing WWV programming and asked for any suggestions of potentially useful content. Indeed, due to the results of the survey, WWV will keep the Geo Alert information they had considered dropping. Thanks to all of you who took the survey. WWV (or the NIST) in many respects, is not only broadcaster, but a tool–a basic radio listener right, at least if you live in North America. Of course, there’s Canada’s CHU too, but it doesn’t have the panache of WWV. Well, in my humble opinion at least (for more on my thoughts of WWV, check out this previous post). For reference purposes, below, (and for our Kindle subscribers) I’ve included information from the NIST website which states all of the features of WWV. Next time you tune in, listen for special announcements in the mix. Voice announcements are made from WWV once every minute. The WWVH announcement occurs first, at about 15 s before the minute. The WWV announcement follows at about 7.5 s before the minute. The announced time is “Coordinated Universal Time” (UTC). UTC was established by international agreement in 1972, and is governed by the International Bureau of Weights and Measures (BIPM) in Paris, France. Coordination with the international UTC time scale keeps NIST time signals in close agreement with signals from other time and frequency stations throughout the world. UTC differs from your local time by a specific number of hours. The number of hours depends on the number of time zones between your location and the location of the zero meridian (which passes through Greenwich, England). When local time changes from Daylight Saving to Standard Time, or vice versa, UTC does not change. However, the difference between UTC and local time does change-by 1 hour. UTC is a 24-hour clock system. The hours are numbered beginning with 00 hours at midnight through 12 hours at noon to 23 hours and 59 minutes just before the next midnight. The WWV interval pulse diagram. Click to enlarge. The most frequent sounds heard on WWV and WWVH are the seconds pulses. These pulses are heard every second except on the 29th and 59th seconds of each minute. The first pulse of each hour is an 800 ms pulse of 1500 Hz. The first pulse of each minute is an 800 ms pulse of 1000 Hz at WWV and 1200 Hz at WWVH. The remaining seconds pulses are short audio bursts (5 ms pulses of 1000 Hz at WWV and 1200 Hz at WWVH) that sound like the ticking of a clock. Each seconds pulse is preceded by 10 ms of silence and followed by 25 ms of silence. The second marker for the broadcast is at the end of the 10 ms period and the start of the 5 ms period. The station’s on-time marker is synchronized with the start of the 5 ms tone. The silence before and after the pulses makes it easier to identify the second pulses. As shown in the graphic below, the total zone around the second pulses lasts for 40 ms, consisting of 10 ms of silence, the 5 ms tone, and another 25 ms of silence. Then, the standard frequency audio tones resume. 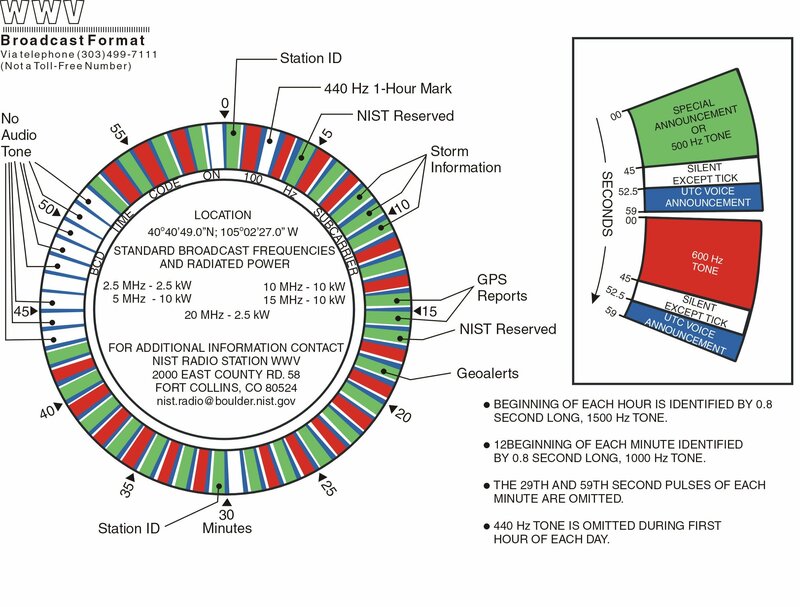 Both WWV and WWVH broadcast standard frequency audio tones that alternate during most minutes of the hour. Most minutes feature a 500 or 600 Hz audio tone. However, a 440 Hz tone is broadcast once per hour, and some minutes do not include any audio tones at all. The 440-Hz tone (the musical note A above middle C) is broadcast once each hour, during minute 2 on WWV, and minute 1 on WWVH. In addition to being a musical standard, the 440-Hz tone provides an hourly marker for chart recorders and other automated devices. The 440-Hz tone is omitted, however, during the first hour of each UTC day. The UTC time scale broadcast by WWV and WWVH meets the needs of most users. UTC runs at an almost perfectly constant rate, since its rate is based on cesium atomic frequency standards. Surprisingly, some users need time that is related to the rotation of the Earth, which is less stable than UTC. Applications such as celestial navigation, satellite observations of the Earth, and some types of surveying require time referenced to the rotational position of the Earth. These users rely on the UT1 time scale. UT1 is derived by astronomers who monitor the speed of the Earth’s rotation. You can obtain UT1 from the time signals broadcast by WWV and WWVH. UT1 is available at two levels of accuracy. If you need UT1 with an uncertainty of 1 s, you can simply use UTC, since the two time scales are always kept within 0.9 s of each other. Occasional corrections of exactly 1 s are inserted into the UTC time scale to keep the two time scales in agreement. These corrections, called leap seconds, are coordinated under international agreement by the International Earth Rotation Service. Leap seconds can be either positive or negative, but so far, only positive leap seconds have been needed. A positive leap second is normally added every 1 or 2 years, usually on June 30 or December 31. If you need UT1 with an uncertainty of 0.1 s, you can apply a correction to UTC. UT1 corrections are encoded into the broadcasts by using doubled ticks during the first 16 s of each minute. You can determine the amount of the correction (in units of 0.1 s) by counting the number of doubled ticks. The sign of the correction depends on whether the doubled ticks occur in the first 8 s of the minute or in the second 8 s. If the doubled ticks are in the first 8 s (1-8) the sign is positive. If the doubled ticks are in the second 8 s (9-16) the sign is negative. For example, if ticks 1, 2, and 3 are doubled, the correction is +0.3 s. This means that UT1 equals UTC plus 0.3 s. If UTC is 8:45:17, then UT1 is 8:45:17.3. If ticks 9, 10, 11, and 12 are doubled, the correction is -0.4 s. If UTC is 8:45:17, then UT1 is 8:45:16.6. If none of the ticks are doubled, then the current correction is 0. WWV and WWVH continuously broadcast a binary coded decimal (BCD) time code on a 100-Hz subcarrier. The time code presents UTC information in serial fashion at a rate of 1 pulse per second. The information carried by the time code includes the current minute, hour, and day of year. The time code also contains the 100-Hz frequency from the subcarrier. The 100-Hz frequency may be used as a standard with the same accuracy as the audio frequencies. 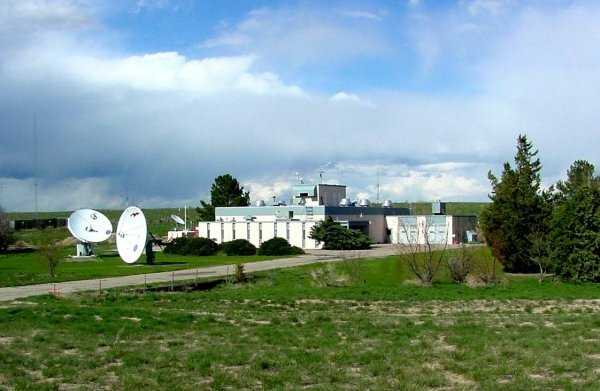 The National Oceanic and Atmospheric Administration (NOAA) uses WWV and WWVH to broadcast geophysical alert messages that provide information about solar terrestrial conditions. Geophysical alerts are broadcast from WWV at 18 minutes after the hour and from WWVH at 45 minutes after the hour. The messages are less than 45 s in length and are updated every 3 hours (typically at 0000, 0300, 0600, 0900, 1200, 1500, 1800, and 2100 UTC). More frequent updates are made when necessary. Solar flux is a measurement of the intensity of solar radio emissions with a wavelength of 10.7 cm (a frequency of about 2800 MHz). The daily solar flux measurement is recorded at 2000 UTC by the Dominion Radio Astrophysical Observatory of the Canadian National Research Council located at Penticton, British Columbia, Canada. The value broadcast is in solar flux units that range from a theoretical minimum of about 50 to numbers larger than 300. During the early part of the 11-year sunspot cycle, the flux numbers are low; but they rise and fall as the cycle proceeds. The numbers will remain high for extended periods around sunspot maximum. The A and K indices are a measurement of the behavior of the magnetic field in and around the earth. The K index uses a scale from 0 to 9 to measure the change in the horizontal component of the geomagnetic field. A new K index is determined and added to the broadcast every 3 hours based on magnetometer measurements made at the Table Mountain Observatory, north of Boulder, Colorado, or an alternate middle latitude observatory. The A index is a daily value on a scale from 0 to 400 to express the range of disturbance of the geomagnetic field. It is obtained by converting and averaging the eight, 3-hour K index values. An estimate of the A index is first announced at 2100 UTC, based on 7 measurements and 1 estimated value. At 0000 UTC, the announced A index consists entirely of known measurements, and the word “estimated” is dropped from the announcement. Space Weather describes the conditions in space that affect earth and its technological systems. Space weather is a consequence of the behavior of the sun, the nature of earth’s magnetic field and atmosphere, and our location in the solar system. Space Weather storms observed and expected are characterized using the NOAA Space Weather scales. The abbreviated table below shows the levels of activity that are included in the announcements and the associated terminology. The descriptor used to identify observed or expected conditions is the maximum level reached or predicted. The NOAA Space Weather Scales are further described at the Space Environment Center’s web site. Geomagnetic storm levels are determined by the estimated 3-hourly Planetary K-indices derived in real time from a network of western hemisphere ground-based magnetometers. Solar Radiation storms levels are determined by the proton flux measurements made by NOAA’s primary Geostationary Operational Environmental Satellite (GOES). Radio Blackout levels are determined by the x-ray level measured by the primary GOES satellite. Every geophysical alert consists of three parts as shown in the two tables below. The first table describes the information contained in the geophysical alert. The second table provides example text from an actual message. 1 The solar-terrestrial indices for the day: specifically the solar flux, the A index, and the K index. 2 Space Weather storms observed during the previous 24 hours. Includes all observed geomagnetic storms, solar radiation storms (proton events) and Radio blackouts (class M1 and greater flares). 3 Space Weather expected during the following 24 hours. 1 Solar-terrestrial indices for 08 November follow.Solar flux 173 and Mid-Latitude A-index 14The Mid-latitude K-index at 1500 UTC on 08 November was 3. 2 Space Weather for the past 24 hours has been severe.Solar radiation storm(s) reaching the S4 level is in progress.Radio blackouts(s) reaching the R2 level occurred. Alternate section 2 No Space Weather storms have been observed during the past 24 hours. 3 Space Weather for the next 24 hours is expected to be severe.Solar radiation storms reaching the S4 level are expected to continue. Radio blackouts reaching the R2 level are expected. Alternate section 3 No Space Weather storms are expected during the next 24 hours. Marine storm warnings are broadcast for the Atlantic and Pacific oceans and the Gulf of Mexico. The National Weather Service provides the storm warning information. Atlantic highseas warnings are broadcast by WWV at 8 and 9 minutes after the hour, and a Pacific highseas warning is broadcast at 10 minutes after the hour. WWVH broadcasts a Pacific highseas warning at 48, 49, 50 and 51 minutes after the hour. Additional segments (at 11 minutes after the hour on WWV and at 52 minutes after the hour on WWVH) are used if there are unusually widespread storm conditions. The brief voice messages warn mariners of storm threats present in their areas. The storm warnings are based on the most recent forecasts. The forecasts are updated at 0500, 1100, 1700, and 2300 UTC for WWV; and at 0000, 0600, 1200, and 1800 UTC for WWVH. 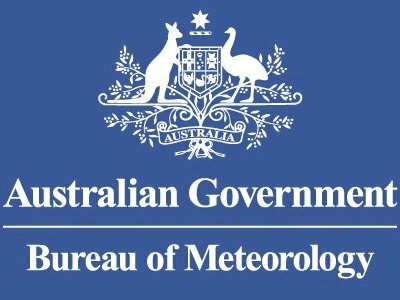 All marine forecasts rely heavily on the Voluntary Observing Ship (VOS) program for obtaining meteorological observations. North Atlantic weather West of 35 West at 1700 UTC; Hurricane Donna, intensifying, 24 North, 60 West, mov­ing northwest, 20 knots, winds 75 knots; storm, 65 North, 35 West, mov­ing east, 10 knots; winds 50 knots, seas 15 feet. For more information about marine storm warnings, write to: National Weather Service, NOAA, 1325 East West Highway, Silver Spring, MD 20910. Or, visit the National Weather Service web site. The United States Coast Guard sponsors two voice announcements per hour on WWV and WWVH, giving current status information about the GPS satellites and related operations. The 40-s announce­ments begin at 14 and 15 after each hour on WWV and at 43 and 44 minutes after each hour on WWVH. The announcement can be heard by telephone by dialing (703) 313-5907. For further information, contact the U.S. Coast Guard Navigation Center, 7323 Telegraph Road, Alexandria, VA 22310, or call (703) 313-5900. This entry was posted in Articles, Broadcasters, Schedules and tagged Marine Weather, NIST, Universal Time, WWV, WWVH on August 16, 2011 by Thomas.